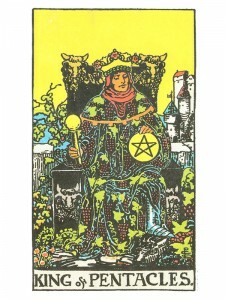 King of Pentacles indicates the mastery of prosperity, harvest, determination and abundance – a solid position. The desire to create and protect that which is financially necessary. A generous soul who is friendly, affectionate, solid, steady and can be of great help. A gifted person who has not been overcome by their position in life. Satisfied with your life, your capabilities and your achievements – success has been justified, which allows you to relax and enjoy it – remaining joyful and at peace with the world and yourself. Your achievements and productivity are direct reflections of your character – your “spirit”. Honor it and become established – a force in your field of endeavor – acknowledge your power and status. Share your knowledge with others – teach, guide, advise and counsel as you contribute to the advancement of your field. Establish a firm, solid foundation. Trust your experience, take pride in your accomplishments. Enjoy your work as you enjoy yourself. How are you using your ability to manage your material affairs? Who is trustworthy yet stubborn? How are you being practical and down-to-earth or who do you know that is? In the first position: Many will depend on you for their basic needs and security, possibly their livelihood, even their lives. This harks back to the lord of the manor/castle whose extended family lived literally under his wing. Our Chief Executive Officers, leaders of industry and heads of family businesses are contemporary society’s closest equivalents. In the second position: You have someone – a family member, a partner, an angel – that you can fall back on. Being part of a family business or an extended family working together fill this bill nicely. In the third position: Think well on this card for he is coming to you in one guise or another. For there is order to be put in your physical/material house, to take charge and make things right. More leadership and control is needed here. In the fourth position: Your earliest tapes of imprint are of this providing father figure, perhaps your own father. It could be of an older family figure such as a grandfather or even someone outside the family – someone famous that you admire. In the fifth position: The mind is on the king. He may represent a plan underway to assume responsibility, take charge or he may be the key player in the present game underfoot. In the sixth position: King on the emotional horizon in the near future. This brings much more authority and security into your love life, maybe even your creative life. You may have to make some minor adjustments in some areas, as kings like to be well – accommodated. In the seventh position: King on the mental horizon in the near future. You may be setting up a new situation with yourself as head. The mind is dedicated to pragmatic affairs, determined that this project or business will succeed. In the eighth position: You are very much in control, centered in your affairs with an eye on all the details. The lord of the manor is in and he is in his throne room. This suggests that things are much to your liking and for all the duties and work involved, being king is nice at the moment. In the ninth position: The heart is on the king. He may be an object of your affection or the centerpiece of a creative project underway. Your heart is accepting a great amount of responsibility. In the tenth position: Here is the support, the energy and resources that you need to secure your Physical/material Plane and it may well come in the physical personage of the King of Pentacles. It may however, be the access to what he represents. Necessity has proved to be the father of invention in this case. Duane, so many ask me similar questions. The divination of each card is not meant to be a “smooth read”. Each card has thousands of meanings, meant for thousands of different people, all asking thousands of different questions. You only need pay attention to the portions of the symbols and specific divination sections which are drawing your focus and creating a spiritual/emotional/mental response within you – it is there you will find your answers. Example: You have asked a specific question and let’s say you turn up the two of cups reversed. You are reading the divination and nothing appears to jump out at you … then suddenly, you read one sentence, maybe even just a few words together that emotionally/spiritually/mentally “grab” you. It is that small portion, when united with the other small portions in the cards you have drawn that will answer your specific question. The core of your writing while appearing reasonable at first, did not sit very well with me after some time. Somewhere within the paragraphs you actually were able to make me a believer unfortunately just for a while. I still have got a problem with your jumps in logic and one would do well to help fill in those breaks. If you can accomplish that, I would definitely end up being amazed.